If you are a child of the 70's & early 80's, you should be familiar with the McDonald's characters (besides just Ronald). Grimace, Big Mac, Mayor McCheese, Fry Guys, the Professor, Captain Crook & Hamburglar. 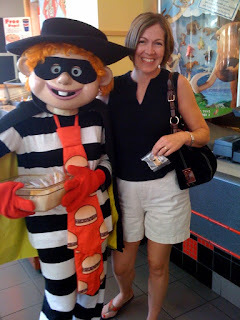 We ran into Hamburglar at the Vancouver Mall today. He even gave me a free sample of McDonaldland cookies. Yum! I sooo remember those guys. I didn't know McDonald's was using them again. Thanks for the heads up! My kids are petrified of people in costumes. It would be a bad day if they ran into one of them when they went to get their happy meal!